If pressed I would have to say that rice is my starch of choice (why I'd ever be "pressed" about that I'm not really sure). When faced with a choice between pasta, potato, corn, or rice, I will almost invariably choose the rice dish. I even love eating the plain white rice that comes with an order of Chinese take out - nothing else really tastes quite like it. The many varieties of rice make it an extremely versatile ingredient. It can be a side dish or the dish itself. Savory or sweet, rice can pretty much do it all. And then there is risotto. Risotto to me is the ultimate expression of what rice can be. Rich and luscious without being too heavy, it is an extremely satisfying meal. A simple risotto makes a great side dish for virtually any meat or fish, and a more dressed up risotto makes an amazing meal on its own. The best thing about risotto though is that it can be made, and made excellently, at home. Once the basic technique is mastered, you can turn out better-than-restaurant quality risotto with no problem whatsoever. 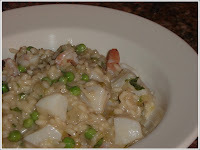 Risotto is both delicious and impressive, and should be a part of any home cook's repertoire. There are tons of different risotto recipes out there, but practically all of them are variations on the same theme: saute the aromatics in oil or butter, add the rice to coat, then slowly ladle in a small amount of stock and stir until it is absorbed, repeating until the rice is cooked and attains its full creaminess. A few things are essential here, first the rice should be a medium-grain rice, preferably Arborio, which is easy to find in most grocery stores. Arborio rice has a higher starch content than regular long-grain white rice, which is what gives the risotto its creaminess. Second, the stock must be added slowly, about 1/2 cup at a time and stirred until it is absorbed. This is what allows the creaminess of the starches to develop. Great risotto is not hard to make, but you must have all your ingredients ready to go before you start (good mise en place is always a good idea when cooking! ), and you also have to be ready to stand at the stove for about 30 minutes. The effort is definitely worth it. Shrimp and Scallop Risotto is a recipe I adapted from Jamie Oliver's Prawn and Pea Risotto with Basil and Mint as a final course for my Christmas Eve dinner the past two years (an extremely filling final course). The first year I cooked the whole thing from start to finish between courses, which was a little slow, so this past year I looked into precooking as an alternative. With a little research I uncovered a technique which I have incorporated into this recipe that allows for partial precooking. If you choose this option and make the risotto ahead of time, you can finish the dish later that day or the next day in about 10 minutes and nobody will be the wiser because it comes out just as good as if you cooked it all in one go. This particular recipe is loaded with shrimp and scallops and has been a huge hit every time I have made it. If you want the fish to take more of a back seat to the rice, cut the amounts of shrimp and scallops in half. Prep all the ingredients then heat the oil in a large saucepan over medium heat. Bring the stock to a simmer in another pot. When the oil is warm, saute the onions, celery, and garlic until just soft, about 6 minutes. Add the rice, season with a little salt and freshly ground black pepper, and stir to combine. Raise the heat to medium-high and stir the rice around for 1 minute. Add the wine and keep stirring until it is all absorbed, about 3 minutes. One of the things you need to know when making risotto is when to add more liquid to the pot. A good rule of thumb is to drag the spoon down the middle of the pot making a divide in the rice and see how long it takes the rice to fill it in. If the rice flows immediately into the space left in the wake of the spoon, it needs more stirring. If you can see the metal bottom of the pan (see the picture below) then its ready for more liquid. Once the wine is absorbed, add about 1/2 cup of hot stock and stir until it is absorbed, again about 3 minutes. As you continue to add stock and stir, you will notice the rice grains beginning to swell, and see the creaminess developing. After about 20 minutes of adding stock and stirring, taste the rice. It should be soft but have a slight bite, but it should not be hard or feel gritty between your teeth. If this is the case, continue adding stock and stirring for a few more minutes. It usually takes me about 25 to 30 minutes to cook the risotto the way I like it once I begin adding liquid. When the rice is done, stir in the shrimp, scallops, and peas. Simmer for 1 minute (2 if you like your shrimp and scallops a little more well done). At this point remove the risotto from the heat and gently stir in the butter, basil, and lemon juice. Immediately cover the pot and let it sit for 3 minutes. Jamie Oliver says this stop gives the risotto a chance to achieve its maximum creaminess, and I'm inclined to agree with him. As soon as the time is up, place the risotto into bowls and serve immediately. If you're precooking the risotto, stop cooking during step 6 when the rice is not quite done, remove the risotto from the pan, spread it in a thin layer on a cold cookie sheet, cover and refrigerate. When ready to continue cooking, place a cup of stock in a pan and bring to a simmer, add the risotto and stir until the liquid is absorbed (3 to 5 minutes). If the rice is still not quite done, add the rest of the stock and finish cooking. Continue on to step 7. I like your writing style. I didn't want to scroll down just to see the pictures. That's quite a nice compliment, thank you!